Hi, everyone! Amy from Positively Splendid here, and I am tickled pink to be back here at Jen’s place for her Happy Holidays series. 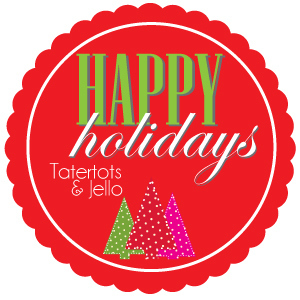 This is always such an amazing source of creative, fun holiday inspiration! One of my favorite parts about the holidays is planning and preparing festive meals for friends and family. I love to set a table that is really inviting for our guests, and the cutlery stockings I’m sharing today are a terrific way to add some fun to any place setting! These are also perfect for buffet-style meals, as they allow guests to easily grab their utensils as they go through the line. Are you ready to see how easily these come together? Let’s get started! To begin, download and print the cutlery stocking templates (linked above). For each stocking, cut 2 stocking body pieces from the burlap (make sure these are cut as mirror images of one another), 1 felt bow piece, and 1 felt bow center piece. Place the 2 stocking pieces together, wrong sides facing. Machine stitch around the perimeter of the piece, leaving the top open. I used a blanket stitch, but you could use any type of decorative stitch, or even a simple straight stitch. Fold the left and right side tabs toward the bow center, so they overlap at the center of the piece. Secure with hot glue. Wrap the bow center piece around the center of the bow to conceal the overlapping edges. Secure with hot glue. Use hot glue to affix the bow to the front of the stocking. Important: Make sure to hold the stocking open until the glue is dry to prevent the stocking from being glued shut! Affix a button to the center of the bow with hot glue, if desired. Once you get the hang of how to make these, you can easily complete one from start to finish in 5 minutes (or less!). I love how the bow embellishment really sets these off. You could also use the same bows to add a cute touch to your holiday gift wrapping! Thank you so much to Jen for having me over today. I’ll be crafting up a holiday storm between now and Christmas, so I hope you’ll pop over to Positively Splendid sometime to say hello! 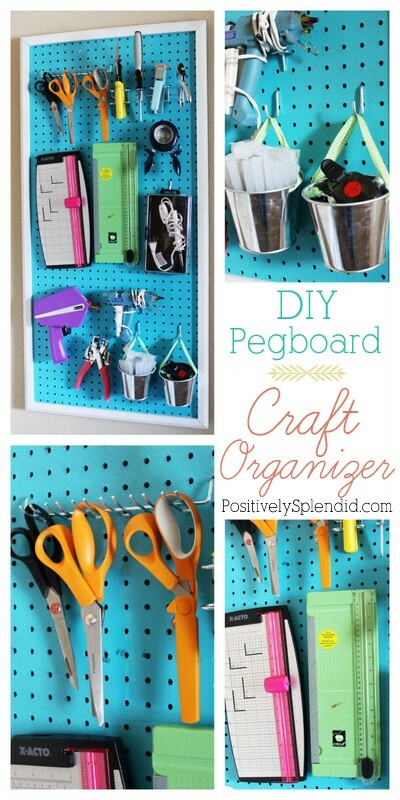 This DIY Pegboard Craft Room Organizer is something that every crafter needs!! I just love the bright color she used, and how everything is so easily accessible! 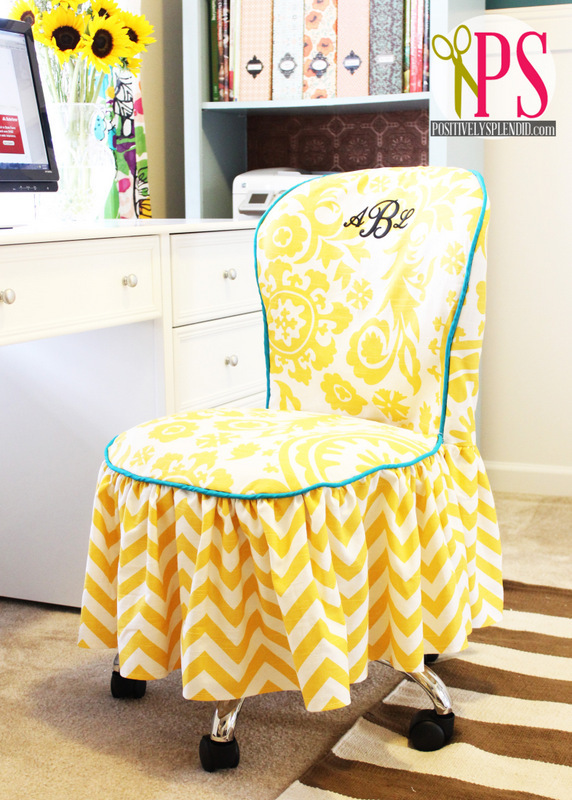 This Office Chair Slipcover turned out so cute! Like I said, Amy has a talent for sewing, and this slipcover is no exception! 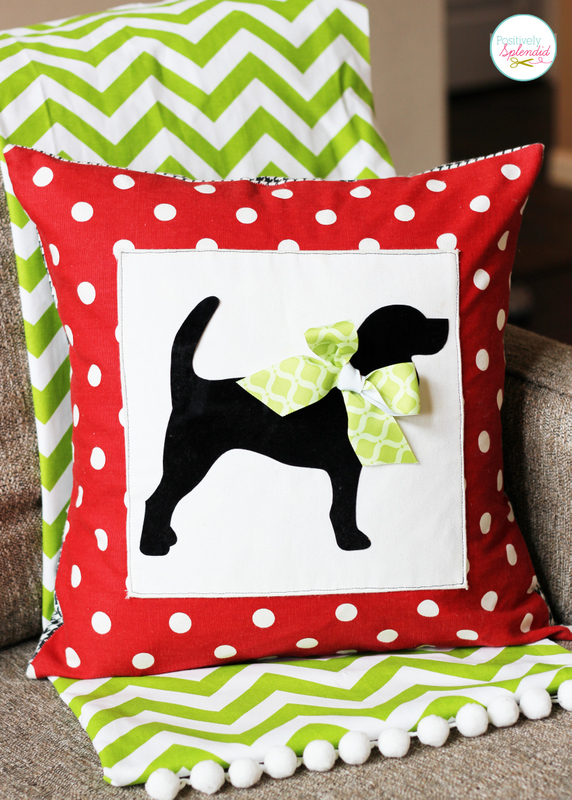 This Custom Pet Silhouette Pillow Cover would be the perfect gift for the pet-lover you know!! Pottery Barn Inspired Gold Pinecone Topiaries! your little christmas bootie place settings are adorable. Love it! This is a great craft – thanks for sharing! These are darling Amy!! I love everything you do. So fun! It’s SO CUTE – Love the whole festive table setting. Beautiful! Thanks for having me over, Jen!